1 tube of choice – I used the beautiful artwork of Joanna Bromley which can be purchased from Digital Art Heaven. 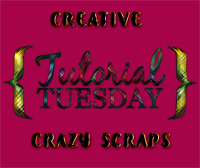 “Lively Lavender” is a tagger size scrap kit created by Tiny Turtle Designs and can be purchased here. Copy and paste Paper 13 Into Selection. Click the lock icon at the top of the layers pallet to lock the layer. Click the lock at the top of your layers pallet to unlock the layer. Copy and paste Paper 1 Into Selection. Copy and paste element 27 Into Selection. Repeat the above step with Template Layer 4. Copy and paste Paper 10 Into Selection. Give it the same slight Inner Bevel. Copy and paste Paper 22 Into Selection. Template Layer 8 and 7 should now be on the same layer. Copy and paste Paper 20 as a new layer. Give the paper layer the same slight Inner Bevel. Element 50 – Change the Properties to Soft Light. Your tube: If you’re using the same as I did, resize 85% and change the Properties to Soft Light. Move these 2 elements into position over the paper that belong to Template Layer 6. Don’t worry about what overhangs and overlaps, we’ll take care of that in a bit. Take a good look at your tag to be sure you like the position of the 3 elements. Click anywhere outside of it with your Magic Wand. Highlight each of the elements that the Properties were changed to Soft Light and tap the delete key. Highlight the tube layer that has the Properties set to Soft Light. 106: Resize 50%//Section off and remove bottom half. Duplicate 2x’s for a total of 3. Duplicate and flip each of them. 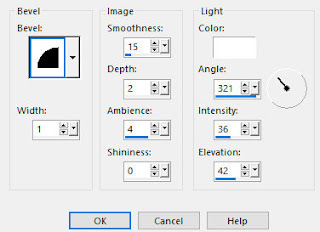 19: Resize 12%/Duplicate/Mirror – Duplicate and flip both elements. Duplicate and flip all 4 elements.